Facing increasing evidence of climate change, scientists around the world are working to improve climate modeling, hoping to provide decision makers solid projections to guide the development of mitigating policies. Khachik Sargsyan is leading a Sandia effort to strengthen climate models through uncertainty quantification (UQ) for the Accelerated Climate Model for Energy (ACME) program. The DOE Office of Science recently launched ACME in an effort to integrate different models and ensure that modeling efforts benefit from the enormous computing power of DOE’s leadership-class facility computers. This initiative is making extensive use of DOE supercomputers to consolidate several multi-lab projects into a single integrated and enhanced program. “ACME consolidates a number of previous efforts and focuses on performing ultrahigh resolution modeling of fully coupled earth–ocean–atmosphere systems to predict climate change effects out to 2050,” explained Christopher Shaddix, manager of the Reacting Flow Research group. Eight national labs are contributing to this effort. The end goal is to develop the most accurate climate change predictions yet, as well as investigate key fundamental science questions, such as the interaction of clouds and climate and the role of secondary organic aerosols. In addition to Khachik, Sandians involved include Andrew Salinger, who is providing software engineering expertise, and Mark Taylor. In addition to acting as the project’s computational chief scientist, Mark is supporting both the atmospheric modeling task and numerical method development, targeting high-performance computing systems. Further, ACME research is closely related to the Intergovernmental Panel on Climate Change (IPCC), a leading international authority on climate change established by the United Nations and World Meteorological Organization in 1988. IPCC distills the latest climate science from around the world to create reports specifically intended for policy makers. As ACME simulation results become available, they will be taken into account by IPCC and will certainly be a part of future IPCC reports. Another critical DOE objective is to enhance confidence in projections by both calibrating the model against historical observations and properly quantifying prediction uncertainties. UQ is a relatively new science—enabled by the improved computational capabilities of the last decade—of quantifying the uncertainties in model inputs and predictions. With support from colleagues Bert Debusschere, Habib Najm, and Cosmin Safta, Khachik is leading the largest UQ effort in the ACME program. Instead of seeking a single result, UQ explores the range of findings provided by running the model multiple times—each time with different values for key parameters. The range of results can then be plotted, as in the simple graph below. Here, the x-axis shows the range of results for the outcome of interest, and the y-axis shows the probability density that each of the results might occur (that is, the area under the curve shows the likelihood that the outcome will be within a certain range of results). 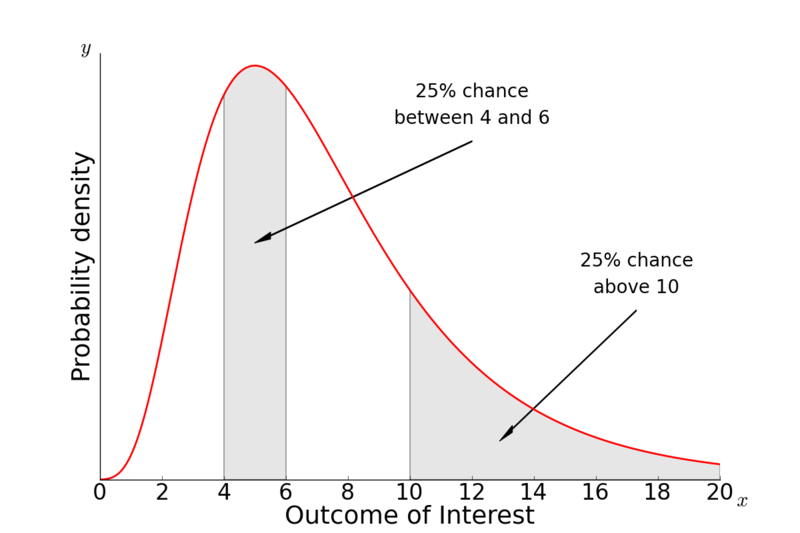 This simplified graph reflects a typical UQ result, revealing that outcome 5 is the mostly likely outcome to occur. 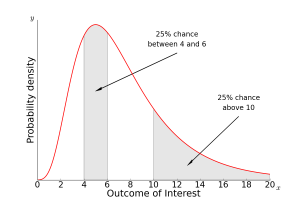 The graph also demonstrates that the 25% chance of an outcome near 5 is the same as that for an outcome of greater than 10—defined here as a potentially catastrophic outcome. “It’s quite easy to see that result 5 is the mostly likely of all the results, but the grey areas under the curve add to the story. They show that there is a 25% probability that the true outcome is within the range of results between 4 and 6 and that there is a 25% chance that an outcome greater than 10 could occur,” said Khachik. This graph is one of the essential outcomes of the so-called forward UQ studies, where the variability in model inputs is propagated toward a range of variability in model outputs. The flip side of the coin is inverse UQ, in which one derives information on model input variability using actual observed historic data. Khachik explains that UQ is needed to assess the confidence in climate simulations—at reasonable cost. “Our research focuses on developing efficient algorithms for making UQ less expensive computationally. Ideally, to get the right answer, you would run the model millions of times with millions of different input parameter settings. But given the size and complexity of climate change models, there simply isn’t the budget for that,” he said. Instead, computational scientists employ advanced UQ methods to extract as much information about the model as possible, within a given computational budget. Khachik works closely with the land modeling partners from Oak Ridge National Laboratory (ORNL) to understand which parameters have the most impact on climate model outcomes and how exactly these parameters should be varied. “That way, you can run the model 100 times, rather than millions of times, and still get the answers you need to make reliable projections,” he said. With such limited model evaluations, UQ practitioners can then build a synthetic, surrogate approximation to the full climate model. This surrogate is typically computationally inexpensive to evaluate and replaces the full model with reasonable accuracy. The UQ methods Khachik and his colleagues develop are notoriously nonintrusive—that is, they do not require programming changes to the original model (in this case, the climate model) that UQ is being applied to. Because of this important feature, UQ methods can be employed in a wide range of applications, from chemistry to materials science to nuclear engineering. It also means that previous efforts in different disciplines can expedite climate modeling UQ. “As we grapple with climate modeling issues, my colleagues and I draw on intuition and formal mathematical machinery from previous UQ studies performed in the context of chemical models that have nothing to do with climate models,” noted Khachik. Initial funding for the effort has been provided by DOE’s Office of Science.